*For an extra thoughtful gift, pair the oil with a Knobble to get at those muscle knots and really work pressure points! This may seem like a gift that would only appeal to a small section of the dad world, but -- in reality -- safety vests can be a very thoughtful gift for so many dads! I addition to the obvious uses when hunting or target shooting, many dads who work in certain job fields would benefit from the added protection that these vests can offer: security guards, teachers, healthcare workers, truck drivers, post office employees, fast food workers, volunteers, politicians, lawyers, and many more! Plus, these BulletSafe vests are pretty much the most affordable we've seen to date! Dads are supposed to protect us, but protecting them can be a loving way to show you care. 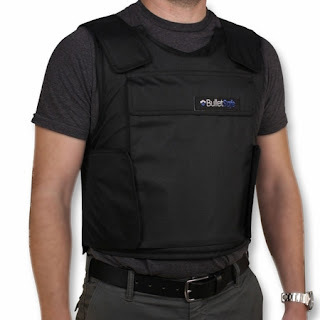 *Did you know that a reliable vest can run in the hundreds, if not thousands of dollars? We like that BulletSafe has made protection available to everyone, with a price tag of under $300! Pizza is a pretty personal thing. If the dad at your house is particular about his toppings, you should consider an innovative gift like Your Slyce! This clever slice separator allows you to get crazy with the toppings, without any cross-contamination. That means we can put mushrooms on my piece and keep them away from hubby's piece (which keeps him from getting grossed out!) It's oven-safe to create a super yummy way to make everyone, especially Dad, happy! *Make your pizzas even more personal; add interesting butter blends and oils to the crust. The Your Slyce will keep those crusts separated! In the words of Mugatu, personalized phone accessories are "so hot right now." Get one for Dad that shows his true love of anything. The Kase cover is completely endless in possibilities to design a dream phone experience. What will Dad want to see on his case? *If Dad isn't in the market for a case, what about a powerbank? Charge on the go with a take-with-you charging tool; KASE will customize it for you! *Disney Movies Anywhere comes with every DVD and Blu-Ray, making it possible for Dad to take the movie on the road, in a plane, or anywhere he goes. Leave the hard copy at home for the kids! Don't laugh, but this may be the BEST gift ever! As much time as we spend in the bathroom, it's time to give Dad a way to stay healthy and keep potty time sacred. We've had a squatty potty in our bathroom for years, and it's truly one of the best investments we've ever made. You can read more about why this invention works, but take our word for it when we say that anything that makes doing the "doody" less stressful is a good purchase to make. We've been using Graco strollers for years. The Click Connect versions are very easy to put together, and this model is pretty much everything an active Dad could ask for! With 5 ways to ride (including infant car seat facing parent or the world, stroller seat facing parent or the world, or traditional), it includes Graco's top-rated SnugRide Click Connect 35 Infant Car Seat! Dad can hit the streets or someplace more rugged with air-filled rubber tires, a safety tether, and red reflectors, too! There's even a place to stash drinks for baby and dad, as well as a smartphone storage area. *Forget the sunscreen? Dad can stay on-task withe the extra-large canopy with breathable mesh that includes a UV50 rating for baby. He'll be wishing there was a canopy for him, too! 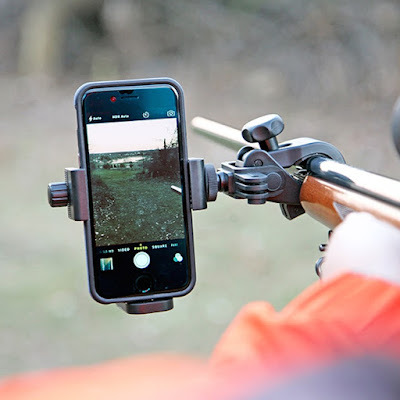 These cool mounts allow Dads to capture hunting action with mounts for rifles and guns, bows and trees! Simply attached your smartphone, and it will deliver 360-degree camera rotation to capture all angles. Each includes a ¼” comb adapter for most gadgets, and is lightweight and comfortable for active wear and lifestyles. *Need a camera to go with that mount? The GoPro Hero is a great buy and perfect for all levels of experience. BONUS GIFT: Snag some bacon for the man in your life. In fact, buy two bags because you'll want some, too! Find out more about Chef's Cut Real Jerky at their website! Wanna Win? We want to give you a head start on your Father's Day shopping by giving one lucky reader $20 in cash (payable via PayPal)! To be entered to win, just use the form below, and be sure that you enter your paypal address. You have until June 7th at 11:59 pm EST to get your entries in, which means you'll get your prize in time to shop! Open to U.S. residents only. *Samples of some items received to review. Opinions are our own. Prizing provided by LillePunkin.com and not the products or companies listed in the guide. I like the Finest Hour Movie DVD the best. One of my favorites is the Bracketron: Xventure Hunting Mount. My favorite item would be H-Joint & Muscle Formula. My favorite is definitely the Your Slyce! We are huge pizza fans and this would be perfect for us! Bracketron: Xventure Hunting Mounts would be perfect my Dad who is always on the go. I can see my husband enjoying The Finest Hours! I have to admit to liking the Squatty Potty, because it rhymes and because let's face it: Toilets are funny. The your slyce is actually pretty cool! Hubby and the kids would all love it! My favorite is the Squatty Potty! I can't wait to get one for our family! Definitely the bulletsafe vest. My husband is a police officer, he already has one, but it has to stay at the pd. My favorite item from the list is the bulletsafe vest. I love the Squatty potty. We use something similar and it really helps with easier potty motion! The gift I like is the Finest Hours DVD. Love the Modes Jogger Click Connect Stroller. My husband would enjoy watching The Finest Hours. My favorite gift from the guide is Your Slyce. I like the cell phone cover! I'd have to say the squatty potty. The Finest Hour Disney DVD has to be the best. I do like the 6. Squatty Potty also! I like the Squatty Potty the best! I also like the Your Slice. The Squatty Potty is funny. Lol! My favorite is the Squatty Potty. I'm considering purchasing one for my home. My sister was gifted with one for Mother's Day. Thanks. My favorite gift is the H-Joint & Muscle Formula. He works hard around the house and needs it. The Your Slyce looks like an intriguing gift! My favorite from the gift guis would be Your Slyce. The Modes Jogger Click Connect Stroller would be a great gift for any dad. It' got to be the Squatty Potty. I think he would like the BulletSafe Vest too. My choice for him would definitely be "The Finest Hour" on Blu-Ray/DVD. That squatty potty would make a fine Father's Day gift. Kase Phone Cover seems like a terrific and useful gift. The Your Slyce is really cool. He might enjoy The Finest Hours movie. My favorite item is the Your Slyce. I like the Your Slyce. My husband likes so many more types of toppings than I want on my part. This would be perfect. I also like the H-Joint & Muscle Formula. This would make a great Father's Day gift not just for Dads, but brothers and uncles as well. My favorite would be the Bracketron: Xventure Hunting Mounts. My uncle would absolutely love it for when he's hunting - which is a lot! The Squatty Potty is my fave! I love the squatty potty! The Finest Hours would be a super gift. My favorite gift from the guide is the Your Slyce. I would like the Kase Phone Cover for him. That would be nice. 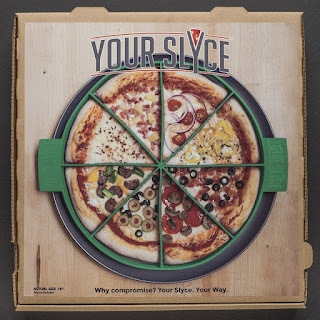 Another great Father's Day gift would be Your Slyce - what a great way to have everyone's Pizza topping favorites all on one slice of pizza. the Modes Jogger Click Connect Stroller. The BulletSafe Vest would be an interesting gift to give. The Finest Hour DVD.Looks like a good movie. the finest hours dvd. never heard of it before. My favorite item from the guide is the BulletSafe Vest. I think he would like the The Finest Hours movie. I know he would like the Bracketron: Xventure Hunting Mounts. Oh those are all such great ideas! I really love the Bracketron: Xventure Hunting Mounts and the Your Slyce! Everyone here loves different toppings on their pizzas! 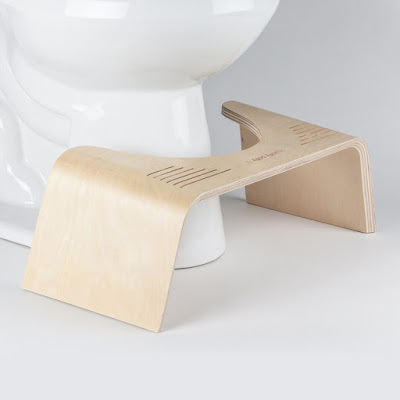 I know it seems so silly, but the Squatty Potty! My nephew's wife got it and she said it's wonderful. My husband would like the Squatty Potty. I like the Joint & Muscle Formula. My favorite item is the Squatty Potty. I actually have that on my Amazon Wish List. The Finest Hours is my favorite. My favorite is the squatty potty! That YourSlyce is kind of brilliant, I want one! "The Finest Hours" would definitely be a great movie to give for a Father's Day gift. I think he would like the Squatty Potty. I have seen it on TV and would like to get it. My favorite item in the gift guide is the Modes Jogger Click Connect Stroller. I like the Modes Jogger Click Connect Stroller. My husband would really like the H-Joint & Muscle Formula. that hunting mount is fantastic. i've never seen that before. i think every man i know would really appreciate it. I think the personalized phone case would be fun. I think the squatty potty is an awesome gift, and an absolutely unexpected one! Modes Jogger Click Connect Stroller. My favorite gift from the Fathers Day gift guide is the Kase Phone Cover. My husband would love the Squatty Potty. He has talked about that subject before. Love the Your Slyce! Great way to keep everyone happy. My favorite is the Modes Jogger Click Connect Stroller. The phone case is really neat! The Modes Jogger Click Connect Stroller is really nice. I like their BulletSafe Vest. Then again, my dad would probably like "The Finest Hours" -- he's all about the action movies. My favorite is Your Slyce. Too cool, what will they think of next? Your Slyce would also be a fantastic and useful gift. Wow this is a good list of stuff to have. I like two of them quite a bit. The bullet safe vest (which I think everyone should have) and they by the slyce for pizza. I would love to see a giveaway for those in the future. I agree 100% the Squatty Potty would be a perfect gift for Father's Day. The Squatty Potty does make it where "doody" time would be more natural than without one. Great ideas, I opt for the vest! I like the Your Slyce. This would come in very handy. Mt favorite gift is the squatty potty. I think it is a great idea. My favorite item is the H-Joint & Muscle Formula. I am not sure he would think he would like the Modes Jogger Click Connect Stroller but I would like for him to have one. I like the Your Slyce!. I think my family would have fun making personalized pizza slices. Thank you for the great gift ideas. 6/05 My favorite gift from the guide is Your Slyce. I like the Squatty Potty. I do think the Squatty Potty would be a perfect gift. These are such great gift ideas. I also like the Bracketron: Xventure Hunting Mounts. I would like for him to have the Bracketron: Xventure Hunting Mount. That would be so good for him to set up a camera to watch the animals walk thru the back yard. I have to admit I like the Squatty Potty, I have heard alot of good things about them lately. The Modes Jogger Click Connect Stroller would be the perfect Father's Day gift for the Dads with Little Ones while trying to stay in shape. The finest hours! It looks like an awesome movie! The Your Slyce is really neat! Oh the The Finest Hours looks like it would be so good! That would be a great Fathers day gift for my dad! My husband would love the hunting mounts! i think the hunting mount is awesome. i'm also a fan of the FINEST HOURS dvd. Been looking at that Squatty Potty since I saw it on Shark Tank! I like the Kase Phone Cover. My husband would love the H-joint and muscle formula. I think that we all could use the H-Joint & Muscle Formula. I am sure he would share. I could really use the Modes Jogger Click Connect Stroller. I think the Kase Phone Cover would be a great unique personalized gift for Father's Day. The Squatty Potty! My mom just had surgery for a prolapse, so everyone could benefit from this item as a gift. OMG! The Squatty Potty for sure!! My hubby would get a kick outta this plus actually use it!!! I think the H-Joint & Muscle Formula would really help my dad!! the hunting mount is a fantastic gift idea! The Finest Hours would make a great gift for my husband. I really love the Modes Jogger Click Connect Stroller and I know my hubby would love it. The H-Joint & Muscle Formula would be my favorite gift.